Disponible avec une licence Workflow Manager. Using Workflow Manager, you can address not just these challenges but many more and balance the issues caused by cost, time, or data errors. 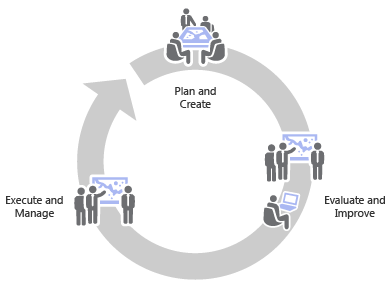 Workflow Manager allows you to streamline and standardize your business process as workflows. The management and tracking of tasks performed or temporarily halted due to an issue are simplified. It automatically records information for each activity and provides tools to report information about each task. Workflow Manager provides tools for allocating resources and tracking the status and progress of jobs. Various email notifications are provided to notify people of the tasks assigned to them, tasks completed, and spatial data edited, among other activities. The Standard or Advanced license is required, along with a Workflow Manager license, to use Workflow Manager. 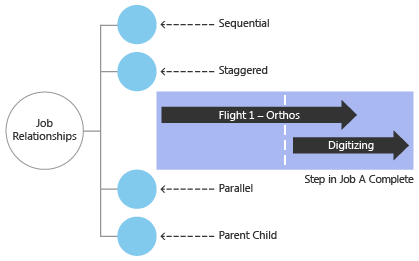 Any business process can be represented as a workflow using a series of steps connected by paths in Workflow Manager. Workflows aim to organize and clarify tasks to ensure that no step is missed. Workflow Manager provides an easy-to-use drag-and-drop user interface that allows any authorized individual to create effective and elegant workflows for the organization. These workflows can be for GIS implementation, non-GIS, or a hybrid of both as required for your organization. In Workflow Manager, a workflow is executed by creating a unit of work called a job, which stores all the information required to perform and complete the specific task. The job can be created and assigned to an individual who is supposed to perform the initial steps in the workflow. The jobs can be executed by registered Workflow Manager users only, within your organization. Each job goes through a status life cycle and has a status associated with it at any given point. The status information is readily available on the job. Job information can be queried to identify the who, what, when, and how of activities on all jobs within your organization. The reports provide a real-time view of the jobs in the Workflow Manager repository. This allows you to communicate information to stakeholders by defining the contents of the reports. These reports can be executed on the desktop or through the Workflow Manager web services. Workflow Manager provides job queries to discover the work assigned to you or your group. These job queries filter the job information to display only the jobs assigned to you and save time. Email notifications are also utilized so a user knows when a job or step is assigned to them. Workflow Manager handles complex geodatabase tasks behind the scenes by assisting the user in the creation and management of versions. An integration of the Workflow Manager and ArcGIS geodatabase tools provides a way of tracking feature edits made through the editing tasks using the geodatabase archiving tools. It also logs information for each job activity to provide complete documentation of work performed. A task may be temporarily stopped due to any reason then restarted; it is also recorded in the history. Workflow Manager allows you to model complex relationships using dependencies and parent-child relationships between jobs. An editing job that has a data collection step can be made dependent on the data collection job so that the editing job cannot go beyond the data collection step until the data collection job has been completed. A parcel update job can be designated as a child of a job that represents the update of a subdivision. Each job can have a spatial extent called the area of interest (AOI). The AOI can be grid based, where each box of the grid represents an individual job. The AOI can also be a freehand drawing or based on existing geographic data such as shapefiles or feature classes. The AOIs can be represented on maps using symbols to represent the status and progress of jobs. 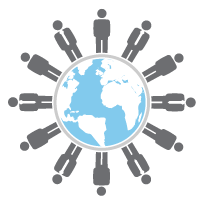 In some organizations, the GIS work is done by staff in different geographic locations. The network might cause a bottleneck in such situations. 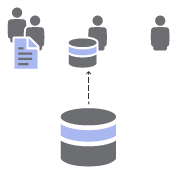 By using the repository replication tools available in the Workflow Manager Administrator, you can share an identical configuration across multiple locations and synchronize the contents to keep track of the GIS work being done at the various locations of your organization. Some part of your workflow may be performed in the field or disconnected from the network. Workflow Manager provides offline job functionality so that you can still work with your jobs in these situations. With offline jobs you can utilize the workflow management capabilities even when disconnected from the network.